Wisconsin -- where workers have a deep and rich history of fighting for a voice on the job -- is the latest state to enact a law intended to sap them of their power and strength. With Gov. Scott Walker's signature, the right-to-work scam is now the law in Wisconsin. As President Obama said after Walker signed the law, it is "inexcusable that, over the past several years ... there's been a sustained, coordinated assault on unions, led by powerful interests and their allies in government." 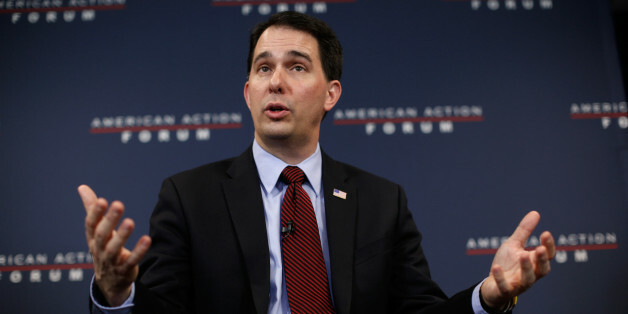 Walker, a likely Presidential contender, has been a general in this assault. This is the governor who in 2011 began his tenure by stealing the collective bargaining rights of public-sector workers. He brags about what he considers his victory against unions and compares the peaceful protesters who demonstrated against his anti-union law to the terrorists of ISIS. Walker told a gathering of ultra-conservatives in March: "If I can take on 100,000 protesters, I can do the same across the world." He's not stepping back. He's doubling down. Walker said on a radio show recently, "The closest thing that I can compare the type of pressure the next President's going to be under is what I went through four years ago with not just the protest, but...with the intimidation, with all the interruptions, with the recall and all the things that happened. And we didn't back down." This is not hyperbole. He views working people as a threat to be vanquished and envisions himself as the conqueror who can bring them to heel. Following that logic, the right-to-work law in Wisconsin is simply a plank in his campaign platform. And Walker is poised to do even more damage. Legislators are considering repealing the prevailing wage, a minimum wage that must be paid to workers on qualifying publicly funded construction projects. Judging by his actions so far, the governor will probably sign this bill, continuing his anti-worker rampage. His view of working families is cynical and does not befit a politician at any level, let alone a Presidential hopeful. But beyond what his support of the right-to-work scam says about who he is, let's look at what these laws actually do. They make it harder for unions to bargain collectively and negotiate favorable contracts that provide higher wages and better benefits for union members. And keep in mind that a good contract doesn't only help workers who are union members; it helps workers across the board, whether union members or not. Why? Because these contracts help establish norms and practices across industries and labor markets. It's no coincidence, therefore, that in states where right-to-work laws are on the books, wages are lower than in states without them. This assault explains why, on the whole, the wages of ordinary people have flat-lined and the average American doesn't make any more today than 35 years ago -- yet gross domestic product per person has increased by 77 percent. It's harder for people to do the things that are considered part of being in the middle class, such as being able to pay for college, save for a secure retirement or deal with an unexpected expense without going deeper into debt. This is especially true in Wisconsin, which has the dubious distinction of having the fastest-shrinking middle class in the nation. Not only do right-to-work laws suppress wages; they don't help states attract new businesses. Their main purpose is to quash the ability of workers to join together in solidarity and stand up to the very powerful. These laws are the result of corporations and the wealthiest Americans - with their friends in political office - having rigged the game for their benefit. Yet, just like the band that kept playing as the Titanic went down, Walker pretends that the right-to-work scam will lure employers to Wisconsin and somehow assist working families. But bear in mind that he is the same governor who promised to create 250,000 new jobs by 2015, thanks to tax cuts for the super wealthy and his union-busting bill that took away collective bargaining from public-sector workers. In fact, Wisconsin lags the United States in wage and job growth. Right-to-work no doubt will inflict further damage on Wisconsin's economy, as it has in other states. But beyond the economic damage, the scam has a very sordid, ugly past. Vance Muse, an early advocate of right-to-work, was an avowed racist who hated unions because he believed they'd lead to more mixing of the races, and in the 1940s, he spread these laws across the South. Politicians who support the right-to-work scam today may not be familiar with this history, but they should be asked whether they're okay with hitching their wagon to a policy promoted in hatred. As President Obama noted, Wisconsin was "built by labor, with a proud pro-worker past." The right-to-work scam is not what we should aspire to in Wisconsin, or anywhere else. The labor movement has played a key role in helping working families enter the middle class and stay in the middle class. That's why the President encouraged Walker to offer workers "the tools they need to get ahead" rather than strip them of their hard-won rights. One of those tools is the power to negotiate with employers and advocate for their beliefs. The right-to-work scam undermines this worthy goal.